"Mrs. Armstrong provides a well rounded perspective on, not only the challenges of living with a variety of mental illnesses that many struggle with, but also with a multi-modal approach on adjusting to and coping adaptively with those challenges." Whoooo, Whoooo, All Aboard For The Trip Of A Lifetime! The Fight For Good Health In The Face Of Chaos! 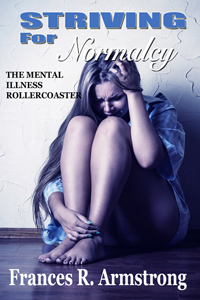 It took me over thirty years to find out I have BiPolar II Disorder. My health began to seriously deteriorate after I turned forty and I crashed my rollercoaster car into a brick wall that shattered my mind into a million pieces. It was the most terrifying experience I'd ever had, I believed at the time, not being able to talk, think, remember, or even stay awake for more than a few hours a day. Was I in for a surprise as the years passed and I rode on the tracks that took me up and down then all around until I was hopelessly lost! This story isn't about being depressed. It's not just about the foolish things I did to myself to escape from reality or the horrible way I treated my loved ones. It's about how to find your way out of the darkness and ensure that the light at the end of the tunnel isn't a train coming from the opposite direction, as the saying goes. It's time to reattach the wheels to the tracks and keep on going, no matter what the odds. I may not ever be completely free of the dark, but I've learned a lot about myself and others just like me in the past twelve years that I'd like to share with you. Come join me on my own rollercoaster and perhaps you too can find a positive, supportive place, where it's not so dark and there are people, websites, and chat rooms, where you too can find the light to guide you home.